Neither the bus driver, identified as a 50-year-old Juneau woman, nor any of her passengers were injured. Police say alcohol did not appear to be a factor. Police are continuing to investigate the crash. Original story | 8:06 p.m. Emergency responders closed off part of Glacier Highway on Saturday evening after a collision near Hospital Drive. 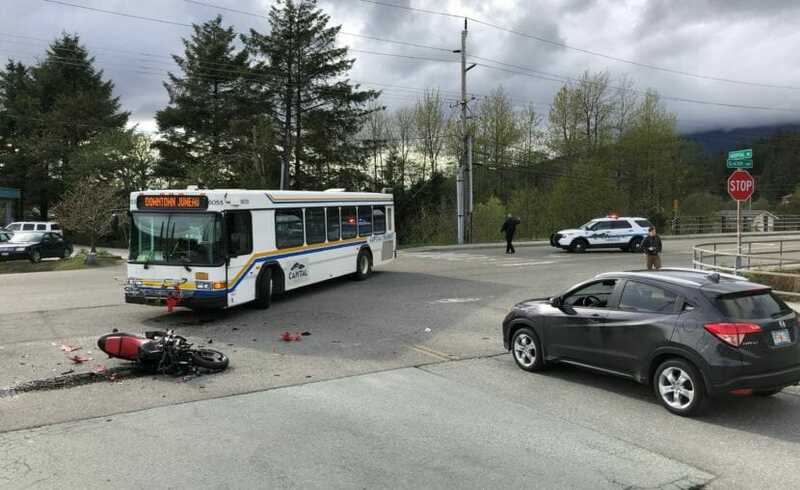 A Capital Transit bus collided with a motorcycle near the entrance to Hospital Drive shortly before 5 p.m.
A motorcyclist was transported to Bartlett Regional Hospital in an unknown condition, according to a Juneau Police Department dispatcher. The area was closed for several hours to everyone except for hospital traffic. The road was reopened shortly before 8 p.m.